The Legend of Greg Olson: Let's face it, catchers are rarely known for being fleet of foot. Greg Olson was no exception. Balding, thick-legged and carrying a boiler that would have made Greg Luzinski proud, Olson was a rock behind the plate and a boulder on the basepaths. So it was that in 1993, Olson sweet-talked the league into a controversial exception: They let him "run" the bases on a four-wheel ATV. Olson still had to bat normally, standing in the box, his gut bulging over the edge of home plate, but when he made contact, he was allowed to hop on the quad (idling next to him during the at-bat) and motor to first. Predictably, opposing managers pitched a fit, but Olson kept on riding that is, until he ran over poor John Kruk on a bang-bang play at first in July. Kruk, who was also built like an all-terrain vehicle, shook off the accident, but Commissioner Bud Selig finally saw the potential for danger. 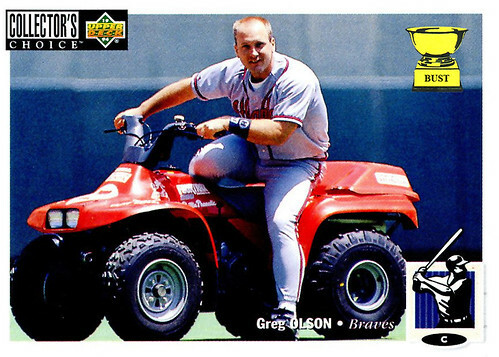 Selig banned the ATV from the field of play, but still allowed Olson to ride around the diamond on one of his son's Power Wheels.